The ArrayIt® Brand Microarray High-Speed Centrifuge has been designed to quickly and efficiently remove wash buffer from microarray substrates (slides) to dry them prior to scanning or imaging. The High-Speed Centrifuge is also equipped a microfuge tube rotor that accommodates up 6 tubes of 0.5 ml, 1.5 or 2.0 ml capacity. 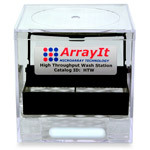 This product is compatible with the ArrayIt® Brand Super Microarray Substrates, the Fluorescent Probe Purification Kit, and many other microarray products. International pricing may vary up to 30% due to costs associated with import taxes, duties, customs clearance and shipping. Arrayit Microarray High-Speed Centrifuges have been designed to provide the user with the greatest safety possible, but these electrical devices operate at speeds of 6,000 revolutions per minute (rpms), and can pose a safety hazard if not operated properly. Users should wear safety glasses at all times and wait to open the rotor cover until the centrifuge has come to a complete stop. 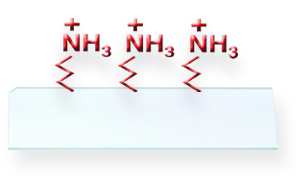 Do not invert the centrifuge while in operation and never submerge the device. 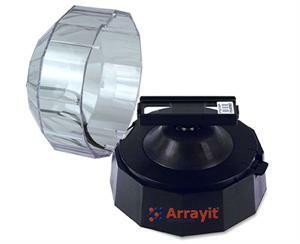 Microarray High-Speed Centrifuge rotors are machined to high-precision and are designed to be used in conjunction with the complete line of high-precision atomically flat Arrayit Microarray Substrates. Arrayit is not responsible for instrument damage or user injury that results from the use of poor quality third party glass slides that are warped, uneven or improperly sized. Failure to abide by these safety instructions may result in serious injury. Arrayit assumes no liability or responsibility for users who are injured while operating the ArrayIt® Microarray High-Speed Centrifuge!